Dave Hawks has a general interest in scarab beetles, but his present research goals relate to the systematics and ecology of ruteline scarabs, primarily the 100 or so species in the genera Plusiotis, Chrysina, Pelidnotopsis, and their nearest relatives. He is conducting taxonomic and phylogenetic studies involving both morphological and molecular character sets. Some of this work is in collaboration with John Heraty, Chris Babcock, Miguel-Angel Morón, José Monzón, Guillermo Nogueira, and Guy Bruyea. 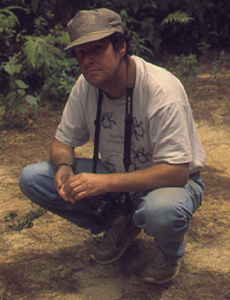 In 1998-99, he and Ronald Cave (Escuela Agricola Panamericana, Honduras) were funded by the National Geographic Society to study several aspects of population dynamics, distribution, life histories, and behavior of Plusiotis and Chrysina species in Honduras. They used mark-recapture methods and obtained estimates of local population sizes and effectiveness of 175-watt mercury vapor lamp attraction. In addition to numerous field trips to Honduras, Dave has visited most other Central American countries to collect and observe these beetles in the field. He became "hooked" on this group of scarabs after two very exciting trips to Costa Rica in 1986 and 1987.